[Food Review] Old Chang Kee RED HOT SPICY 'O - Does it burn tongues? I get some form of gratification out from torturing my bowels with spicy food (I even have a #Spicybean hashtag for all the spicy food I have eaten). 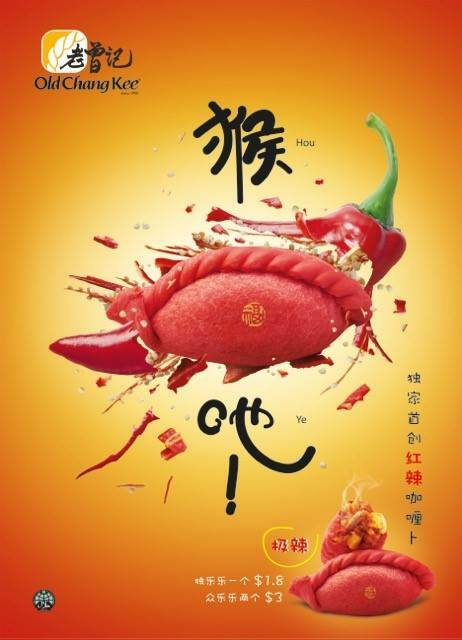 After I saw the poster, I knew I had to get them - anything that dares to say “极辣” (extremely spicy) needs to affirmed by the #Spicybean. Side story: The aunties that served me at Hougang Old Chang Kee (OCK) outlet damn cute. "Auntie, 2 of that red one"
"Red one ar? Spicy one leh. Ssssssssss (mimicking the sound you make when flame leaves your tongue)"
The Spicy 'O is a spicier version of the classic Curry 'O but covered in red pastry. There is no doubt that OCK's curry puff is still one of the best in Singapore, and this version maintains that standard. The only difference is that it is spicier. Substantially spicier. It is not that kind of spiciness that burns your tongue, rather, the spiciness lingers in your stomach, and makes you feel that a LS (laosai) is incoming but you know it is not anytime soon. 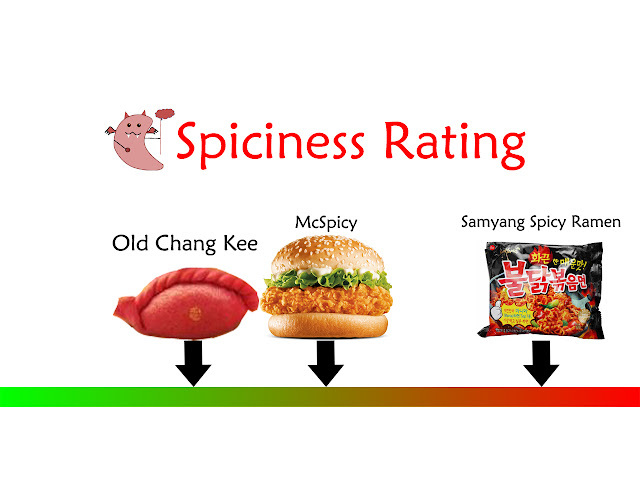 Comparing it against our Singapore spiciness benchmark, the OCK Spicy 'O is milder than McSpicy. However, to anyone that finds chicken rice chilli spicy, this can be a killer for you. It's still damn delicious though. And the promotion of 2 @ $3 makes you feel that you are missing out a lot of savings if you get just only 1. Well played OCK. The RED HOT SPICY 'O will be available from 25th Jan 2016 to 31st Mar 2016. I enjoyed reading your blog! I might have to give this a go and see how it tastes! I ate the curry puff before reading this comment. I can testify that IT IS SPICIER than McScpicy. GG LAH BRO! Nan Hwa Fishboat - NEW Outlet at Owen Road! [Singapore] PROMO CODE: 50% OFF Domino's Pizza!